Jacqui is fabulous. I have had surgery on my back, which has left some nerve damage in my leg, Jacqui is helping to get me back on track. I feel so much better after each session as she works on all the muscles that are over compensating due to my weak leg. Highly recommend her. Jacqui helped me to loosen muscles which had become very tight due to back and sciatic pain. It was a very thorough massage, done at the level you can handle. I would recommend Jacqui for her massage skills, technique and professionalism at making you feel comfortable and easing tired or painful areas of your body. Thank you Jacqui. Your magic hands have worked miracles on my stiff neck and sore muscles. 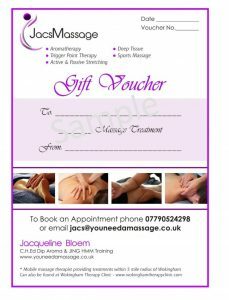 Jacqui gives a wornderful deep tissue massage and I highly recommend her to anyone with sore and aching muscles. It's not easy to find a good massage therapist and Jacqui ticks all the boxes! Looking forward to the next one. I have had several massages from Jacqui. She has an amazing technique and remembers between sessions exactly what works for you. My husband and I were lucky enough to have Jacqui massage us on a regular basis for over a year. Her knowledge and skill far surpass anyone else I have ever had work on me. From basic everyday stress relief to more advanced work on particularly stressed and even strained areas, a massage with Jacqui is something that can't be beaten! We miss her kind, friendly, professional way and have never quite found someone to replace her. Jacqui Bloem was my massage therapist in South Africa for over 5 years. There is not a week that goes by where my shoulders and back don't miss her! She is incredibly talented and, is without doubt, the best massage therapist I know. Jacqui has a knack of knowing exactly what needs to be worked on without you bringing it to her attention. Her technique is both healing and soothing. She finds those knots and massages those trigger points to provide essential relief. Jacqui is just wonderful and anybody would be most fortunate to have her as their massage therapist! I was extremely fortunate to have Jacqui as my massage therapist for over a year. Her ability to assess the area of stress in your body very quickly was proof of not only her qualification but her natural gift of understanding the stress areas. My neck and shoulders are a constant source of pain for me and she controlled the tension in those areas to perfection. The ultimate treat for me was that Jacqui would come to the house, so by booking a time later in the day allowed for a complete hour of relaxation followed by a hot bath and straight into bed. The ultimate package! We miss Jax every single day here in South Africa and have yet to find someone with the same abilities and beautiful nature to fill her golden shoes. Jacqui did massages for us on a weekly basis. We miss her excellent massages and professional manner. We would recommend her to anyone! Jacqui began providing me with massage treatments in early October 2005 and treated me regularly. I have experienced chronic back and pelvis problems all my adult life and at the time she commenced treating me, I was also debilitated from serious fatigue and major bereavement. Jacqueline's treatments were always extremely effective in providing relief from back pain and discomfort. She uses a variety of deep tissuue and therapeutic techniques that enable her to respond to particular needs at particular times in a way unique in my experience of massage therapists. Some of her techniques were particularly energizing and balancing for me at times when I really needed this. My osteopath was impressed by the assistance her massage provided me in stabilizing my back problems. From a patient's perspective, Jacqui is a natural healer whom I cannot recommend highly enough. Jacqueline specialises in Aromatherapy and Deep Tissue Massage treatments, incorporating trigger point therapy and other clinical massage techniques. She also provided luxurious Hot Stone Therapy treatments. Jacqui was professional, friendly and efficient, always providing massage treatments to suit the clients own personal needs. The feedback from the cllients was always excellent! In my time as a teacher and trainer of massage, spanning over a decade, I have worked with over a thousand therapists. From that point of reference, I have no hesitation to regard Jacqui as exceptional. She has the appropriate balance of intuition, client sensitivity and academic knowledge to be a truly talented therapist. Her familiarity with the anatomy, physiology and pathology of the human body serves her in finding a successful and efficient course of treatment for the individuals she treats. She is professional and informed. Her drive to seek out as much additional training as possible will serve her well in creating a successful future career.